Skyscrapers to Burn, Cities to Be Destroyed In 1901 Ellen White saw fireproof skyscrapers not yet built come crashing down after burning like pitch. Will this vision come true? 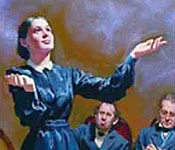 Crime and Natural Disasters to Increase Ellen White foresaw an increase of natural disasters in the end of time in connection with "scenes of strife." What can we learn from the example of New Orleans? Ellen White: On the Future of Protestantism Have the churches that grew out of the Protestant Reformation of the sixteenth and seventeenth centuries held fast to the principles on which they were founded? As time goes on, will they maintain these principles, or will they go down the slippery slope of compromise and apostasy? The Lord’s Day Controversy Many people are unaware that there has been a controversy over which day of the week is the Lord’s day—the Sabbath. Here we present some of the highlights of Ellen White's prediction that this controversy will reach a crescendo in the last days. The United States in Prophecy The United States is known for the freedom of conscience that it has stood for since its founding. Ellen White clearly stated what she believed would be the future of this world power and whether it would continue to defend the freedom of its citizens to worship God according to the dictates of their conscience.